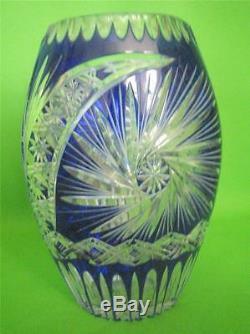 BOHEMIAN Cut to Clear Cobalt Crystal Vase. VINTAGE Bohemian Czech Cut to Clear Cobalt Crystal Vase Very heavy 1/2 thick glass. Measurements: 10 3/4" tall, 7" wide and 4 1/2 deep. No chips, scratches, cracks or repairs. To see more of our eclectic selection of European and American Antique & Vintage Collectibles. By placing an Order you acknowledge that you Read and Agree with the store Terms and Conditions of sale. The item "VINTAGE Bohemian Czech Cut to Clear Cobalt Crystal 11 Tall Vase" is in sale since Wednesday, April 2, 2014. This item is in the category "Pottery & Glass\Glass\Art Glass\Bohemian/Czech\Other Bohemian/Czech Art Glass". The seller is "objects4art-us" and is located in East Cost. This item can be shipped to United States, Canada, United Kingdom, China, Mexico, Germany, Japan, Brazil, France, Australia, Denmark, Romania, Slovakia, Bulgaria, Czech republic, Finland, Hungary, Latvia, Lithuania, Malta, Estonia, Greece, Portugal, Cyprus, Slovenia, Sweden, South Korea, Indonesia, Taiwan, South africa, Thailand, Belgium, Hong Kong, Ireland, Netherlands, Poland, Spain, Italy, Austria, Israel, New Zealand, Philippines, Singapore, Switzerland, Norway, Saudi arabia, Ukraine, United arab emirates, Qatar, Kuwait, Bahrain, Croatia, Malaysia, Chile, Colombia, Costa rica, Panama, Trinidad and tobago, Guatemala, Honduras, Jamaica, Antigua and barbuda, Aruba, Belize, Dominica, Grenada, Saint kitts and nevis, Saint lucia, Montserrat, Turks and caicos islands, Barbados, Bangladesh, Bermuda, Brunei darussalam, Bolivia, Ecuador, Egypt, French guiana, Guernsey, Gibraltar, Guadeloupe, Iceland, Jersey, Jordan, Cambodia, Cayman islands, Liechtenstein, Sri lanka, Luxembourg, Monaco, Macao, Martinique, Maldives, Nicaragua, Oman, Peru, Pakistan, Paraguay, Reunion.